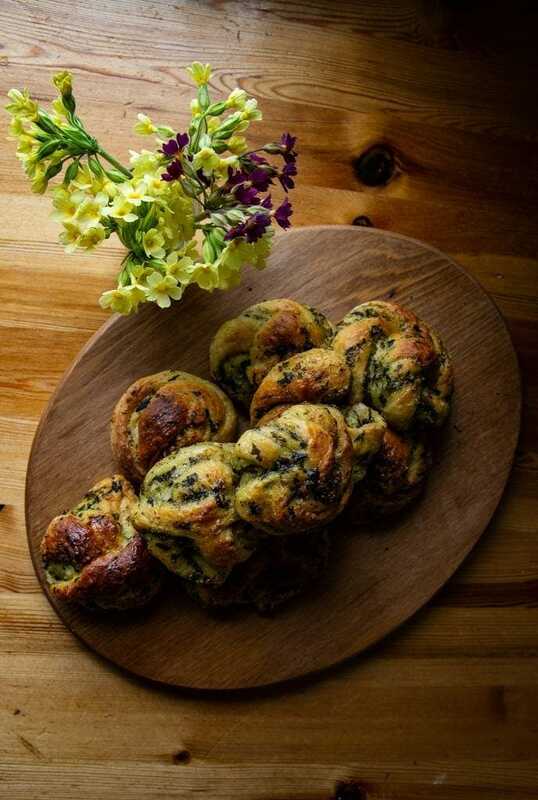 Winged Kelp Pesto Buns - Lofoten Seaweed | From Lofoten, Weed Love. 1. Soak the butare for half an hour in water. 2. Once rehydrated, squeeze the butare, getting rid off as much water as possible. 3. Place all ingredients in a blender and blitz to a paste. 1. In a pan, warm the milk until steaming but not boiling. Add the butter and set aside to cool until lukewarm. 2. Put the flour, sugar, salt and yeast into a large bowl. Mix until well combined. When the milk and butter mixture has cooled, add to the flour and mix to form a soft dough. Tip onto a work surface and knead for 10 mins, until the dough is smooth and stretchy adding more flour if needed. Place the dough into a bowl, cover with a tea towel or cling film and leave to rise for 1- 2 hrs or until doubled in size (you could prove it in the fridge overnight). 3. Punch the dough down to knock out the air, then roll to a rectangle roughly 35 x 45cm, with the longer edge facing you. Spread the pesto over the surface, right to the edges. Fold left side to the middle, than fold the right side over the left side. Turn the dough so that the openings are on the left and right sides and roll out the dough slightly. With a sharp knife or pizza cutter cut the dough into 1,5 – 2 cm wide strips. Take a strip, twist it then wrap around your first and second fingers twice, then tuck the ends inside the circle of dough you’ve just made. 4. Place the shaped buns on a lined baking tray and preheat the oven to 180°C/350°F/gas 4. Leave the buns to rise until doubled (about 30 minutes). 5. Bake for 15-20 mins until golden brown – swap the trays halfway through if they’re browning unevenly.